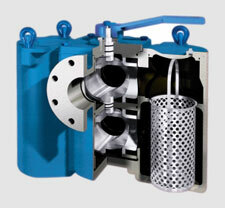 Patented diverter cartridge assures leak-tight isolation of basket chamber during cleaning. No more rushing to finish the job before the out of service chamber overflows. And... with no overflow, there’s no clean-up. A unique flow diverter valve cartridge in the Model53 BTX isolates the two strainer basket chambers and prevents fluid bypass. 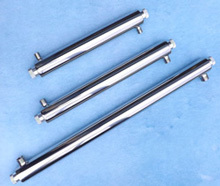 An easy-to-turn handle operates the cartridge and diverts the system flow from one chamber to the other—the flow in the pipeline is never shut off. When a strainer basket needs to be cleaned, the lever handle is turned to take it out of service and to divert the flow through the other chamber. The position of the handle clearly indicates at all times which chamber is in service. No special tools are needed to access the strainer basket for cleaning. The chamber is first drained and then the cover is lifted and swung clear of the chamber opening. The dynamic diverter cartridge seals prevent fluid bypass into the out-of-service chamber—making for easy, hassle-free strainer basket servicing. Size 5" up to 8"
The Hayward Model 50 Plug Type Duplex Strainer is a simple, economical, and trouble free design...time tested in applications around the world over many years. 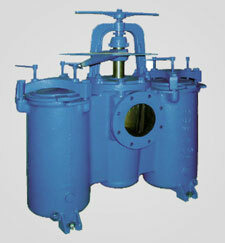 This type of strainer is actually a high quality, pressure rated plug valve with integral straining baskets. Switching the flow from one basket to the other is accomplished by moving the operating handle through a 90 degree arc. The design is such that is impossible for this operation to stop the flow because of the unique port design in the diverter plug. The entire switching operation takes less than 30 seconds. No tools are needed. The plug is automatically positioned each time in exactly the right spot by integral stops. Other important features of the plug type Model 50 Duplex Basket Strainers include Hayward’s quick opening, swing away yoke design covers. No tools are required to remove the covers for quick and easy access to the strainer baskets, and they go back on just as fast as they came off. Draining of the basket chambers is simplified with the standard NPT drain taps – and all sizes are provided with mounting legs for bolting the strainer to the floor for a rock solid installation. 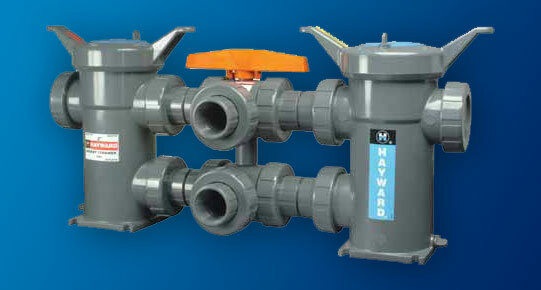 Hayward’s plug type Model 50 Duplex Basket Strainer is your best choice for most applications. Its rugged design and ease of operation have made it the duplex strainer of choice around the world in hundreds of different industries. When pipeline system components require protection from dirt and debris and the line cannot be shut down for basket cleaning, a Hayward All Plastic Duplex Basket Strainer is the ideal choice. Unwanted particles are removed as the process media passe through a perforated strainer basket contained inside the strainer body. The basket traps the unwanted material while allowing the process media to flow freely. Cleaning or changing the strainer basket is quick and easy. Turning the operating handle on the diverter valve assembly switches the flow from one strainer housing to the other. Then, the out of service housing can be serviced by opening the hand removable, spin-off cover for access to the basket. The cover features two angled handles for easy opening and closing. The housing has external cover threads that do not contact the process media eliminating the need for cleaning. Venting and draining are easily accomplished by using the hand removable, threaded plugs on the cover and the side of the housing. The strainer can be installed either in-line or with a loop piping configuration. This is made possible by changing the orientation of the bottom outlet connection. Just loosen the connection assembly nuts on the bottom diverter valve and rotate it 180 degrees to convert from one type of connectionto the other. Maintenance is simplified by the strainers true union piping connections which make it possible to remove the strainer from the pipeline without breaking down piping connections. Plastic baskets in perforation sizes from 1/32” to 3/16” and stainless steel baskets from 1/2” perforation down to 325 mesh are available.